Carl F. Strauch was a librarian and an academic—he wrote a dissertation on Ralph Waldo Emerson and taught for many years at Lehigh University—and Lovecraft was intrigued by Strauch’s recital of witch legendry from the Pennsylvania Dutch region of Pennsylvania where he resided. The young Lee White was a student at Howard College in Alabama when he came into contact with Lovecraft, and the ten letters they exchanged over several years cover a wide range of literary topics. In one of his last letters Lovecraft makes extensive revisions on a poem about John Donne that White had written. These letters reveal Lovecraft to have as wide a range of intellectual and aesthetic interests as his diverse and multifaceted correspondents. As in all previous volumes in the Collected Letters series, these letters have been meticulously edited by S.T. Joshi and David E. Schultz, two of the leading authorities on Lovecraft. Also included are many rare and pertinent writings by the various correspondents, which shed light on their relationship to Lovecraft. An exhaustive bibliography and a comprehensive index conclude the volume. H.P. 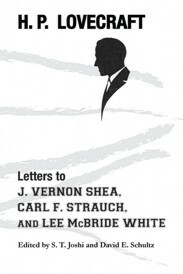 Lovecraft: Letters to J. Vernon Shea, Carl F. Strauch, and Lee McBride White.. By H.P. Lovecraft, Edited by S.T. Joshi and David E. Schultz. New York, NY: Hippocampus Press; 2016; ISBN 978-1-61498-156-5; paperback, 438 pages.